What are risk factors for seborrheic dermatitis? What are seborrheic dermatitis symptoms and signs? What specialties of health care professionals diagnose and treat seborrheic dermatitis? How do health care professionals diagnose seborrheic dermatitis? Are there home remedies for seborrheic dermatitis? Seborrheic dermatitis is probably the single most common inflammatory skin condition affecting humans aside from acne vulgaris. Seborrheic dermatitis is highly treatable but incurable. The course of seborrheic dermatitis is characterized by spontaneous remissions and exacerbations (flare-ups). Seborrheic dermatitis affects all ages. Seborrheic dermatitis is a chronic inflammation of skin that typically waxes and wanes. Seborrheic dermatitis produces a red scaling, occasionally weepy, oozy eruption. 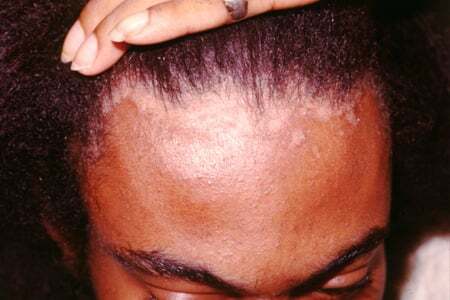 Seborrheic dermatitis commonly involves portions of the scalp, brows, mid-face, ears, mid-chest, and mid-back. It is not unusual for it to affect the skin of infants and young children where it often involves the scalp (cradle cap) and the diaper area. Seborrheic dermatitis is also known as seborrhea. Since both of these conditions can affect the scalp with an itchy scaling dermatitis, it can sometimes be difficult to distinguish one from the other. Aside from scalp involvement, psoriasis typically involves anatomically different areas of skin than seborrheic dermatitis. In addition, seborrheic dermatitis is an eczematous dermatitis producing a weepy, oozing appearance. 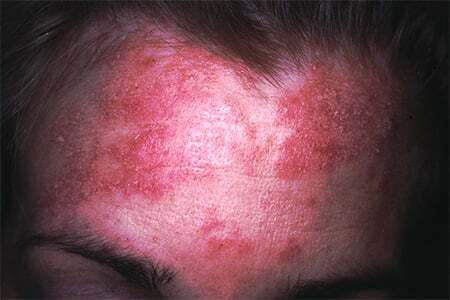 Psoriasis produces papules and plaques of scaling red skin. A pathological examination of a skin biopsy is rarely necessary to distinguish these two conditions. Dandruff is simply a sign of the excessive production of skin. It can be seen in a number of inflammatory skin diseases, including seborrhea and psoriasis. Although almost all patients with seborrheic dermatitis are generally healthy, there does seem to be an association with diseases of the central nervous system and AIDS (HIV). Medical professionals have a poor understanding of the causes of seborrheic dermatitis. There are some newly recognized genetic influences in seborrheic dermatitis. Eleven gene mutations or protein deficiencies appear to be more common in individuals with seborrheic dermatitis. Most of the genes play a role either in the immune response or epidermal differentiation. Since this condition tends to occur in areas of heavy sebum production, it is felt that oily skin may be a factor leading to seborrheic dermatitis. In addition, it seems that many patients with seborrheic dermatitis have an abundant growth of a normal skin yeast (Pityrosporum or Malassezia) in the affected areas. The fact that topical antifungal medications are effective in controlling seborrheic dermatitis has led some to conclude fungi may play a role in causing this disease. Whether these normal members of the cutaneous microbiome play a causal role in seborrheic dermatitis remains to be determined. Patients with severe central nervous system disease (dementia and traumatic brain injuries) seem to have more trouble with seborrheic dermatitis. It is unclear if the nervous system plays a role in causing seborrhea or that it is simply a lack of normal hygiene. The rash itself is characteristically red and scaling but occasionally can become weepy and oozy. The scaling can be extensive enough to produce significant dandruff and may be the patient's major complaint. The distribution of this rash is often of great help in making the diagnosis. In adults, areas commonly involved include the scalp, the outer ear, and external auditory canal, the forehead, the eyebrows, the eyelids, the cheeks adjacent to the nose, including the folds that extends from the nose to the sides of the mouth, and less commonly the armpits, the mid-chest, and mid-back regions. In babies, the rash causes a scalp eruption commonly called "cradle cap." It can also be more extensive and involve the diaper area as well. Although in both adults and children the rash may have no symptoms, it commonly causes itching, especially in the scalp. Most primary care physicians, pediatricians, internists, and family doctors are able to diagnose and treat seborrheic dermatitis. Occasionally, it may be necessary to refer patients to a dermatologist for a diagnosis. The diagnosis of seborrheic dermatitis is usually made clinically, meaning that the doctor recognizes it on the basis of its appearance. Occasionally, a scraping of skin scales treated with potassium hydroxide is examined using a microscope to exclude a fungal infection. A skin biopsy is rarely required for diagnosis. In addition, the application of a prescription-strength topical steroid lotion or solution of weak to moderate potency is effective such as desonide (Desonate, DesOwen, LoKara, Verdeso), betamethasone valerate (Valisone), hydrocortisone, and triamcinolone (Aristocort, Aristocort HP, Kenalog, Triderm). For non-hair-bearing areas, the application of a weak to moderately potent topical steroid or topical antifungal cream is frequently effective. The use of topical calcineurin inhibitors, tacrolimus (Protopic) or pimecrolimus (Elidel) ointments, can be effective but is quite an expensive alternative. Patients may also use ketoconazole-containing creams for the treatment of seborrheic dermatitis. It needs to be stressed that since this condition is incurable but easily controlled; if the disease is active and the treatment is stopped, one should expect the seborrheic dermatitis to recur. One should also use effective medications just frequently enough to control the symptoms. Excessive treatment of apparently normal skin is economically wasteful as well as potentially risky. There is little compelling evidence that any of the following substances taken either orally or used topically are of any significant benefit in the control of seborrheic dermatitis: coconut oil, apple cider vinegar, tea tree oil, or biotin. On the other hand, 1% hydrocortisone, which is inexpensive and easily available without a prescription, is likely to be very effective in controlling seborrhea. There are few complications attributable to this condition. Most problems seem to be related to misdiagnosis or mistreatment. Rarely, certain superficial cutaneous (dermatophyte) fungal infections of the face and scalp can resemble seborrheic dermatitis. If dermatophyte infections are mistakenly treated with anti-inflammatory medications (topical steroids), more extensive involvement could be encouraged. The overuse of potent topical steroids in an ill-conceived attempt to cure this condition, especially on the face and armpits, can result in many undesirable skin changes including skin thinning. Severe seborrheic dermatitis can occasionally produce thinning or loss of hair, in great part probably related to excessive scratching. As the disease is controlled, regrowth is expected. Since seborrheic dermatitis generally is not associated with any serious problems, one way of looking at prognosis would be optimistically. On the other hand, although treatment almost always results in an excellent response, it is unlikely to result in any durable, permanent resolution of the disease. Seborrheic dermatitis is not preventable. Borda, Luis J., M. Perper, and J.E. Keri. "Treatment of Seborrheic Dermatitis: A Comprehensive Review." Journal of Dermatological Treatment. 2018 DOI: 10.1080/09546634.2018.1473554. Clark, Gary W., Sara M. Pope, and Khalid A. Jaboori. "Diagnosis and Treatment of Seborrheic Dermatitis." Am Fam Physician 91.3 (2015): 185-190. Ijaz, N., and D. Fitzgerald. "Seborrheic Dermatitis." British Journal of Hospital Medicine 78.6 June 2017: C88-C91. Okokon, E.O., J.H. Verbeek, J.H. Ruotsalainen, O.A. Ojo, and V.N. Bakhoya. "Topical Antifungals for Seborrheic Dermatitis (Review)." Cochrane Database of Systematic Reviews 5 May 2, 2015. Stefanaki, I., and A. Katsambas. "Therapeutic Update on Seborrheic Dermatitis." Skin Therapy Lett. 15.5 May 2010: 1-4.